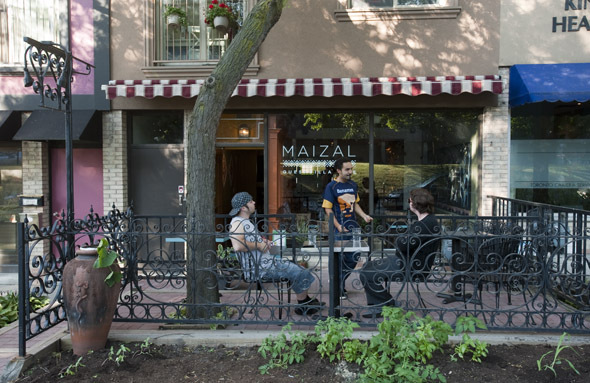 Maizal Quesadilla Café, is the newest addition to Liberty Village , bringing the neighbourhood a refreshing dose of Mexican flavour just in time for summer. The address on Jefferson, south of King, had me expecting a no-frills storefront – instead, I was pleasantly surprised to discover a tasteful eatery heralded by a beautiful shade-covered patio. Inside, the cafÃ© is awash with colour – a vibrant, jewel-toned space decorated with ornate moldings, terracotta accents, embroidered folk art and a shiny pressed tin ceiling. Overall, the space is charming and inviting. For owners Gabriela Ituarte and Ivan Wadgymar this is more than just a restaurant. 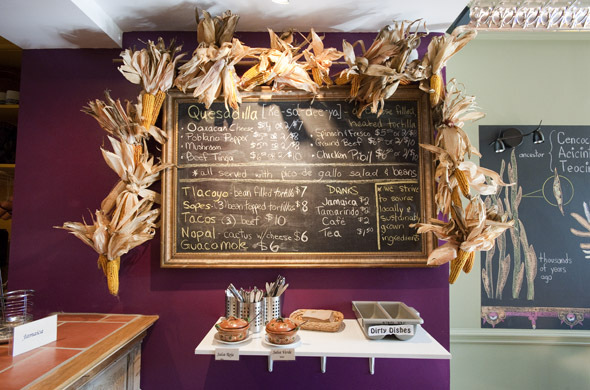 Blackboard menus and murals illustrate traditional Nixtamal techniques for grinding corn and pay tribute to Mexican ancestors. Emboldened by time spent at Chocosol , Gabriela and Ivan attribute their experiences there with instilling a passion and emphasis on "community, social enterprise, and traditional methods." The menu is small--about a dozen dishes--and the focus is on Mexican quesadillaria styled street food made using traditional techniques. Everything is made from scratch – the corn tortillas begin as Kawartha CSA corn that is cooked, hand-ground, and pressed into tortillas. The often overlooked flavour of corn shines and I am surprised when even the Guacamole ($6) is outdone by what are really tasty chips. Our first quesadilla, The Beef Tinga ($6 or 2 for $10) arrives filled with tender beef and gooey Qaxacan cheese. These are not your run-of-the-mill, barroom quesadillas. The corn tortilla is unlike any I've had before – I am mainly accustomed to the cardboard-like, stale variety and for this reason, I typically lean towards flour tortillas. Ivan tells me later that I'm not alone; even in Mexico, corn tortillas are no longer in favour, shunned because flour tortillas are easier to make and have a longer shelf life. Here, they are made fresh daily and are soft, warm and almost naan-like. The Spinach Fresco ($6 or 2 for $10) hardly disappoints. The spinach and soft cheese filling are a great flavour combination and make for a balanced meatless meal. My only regret is not getting two. 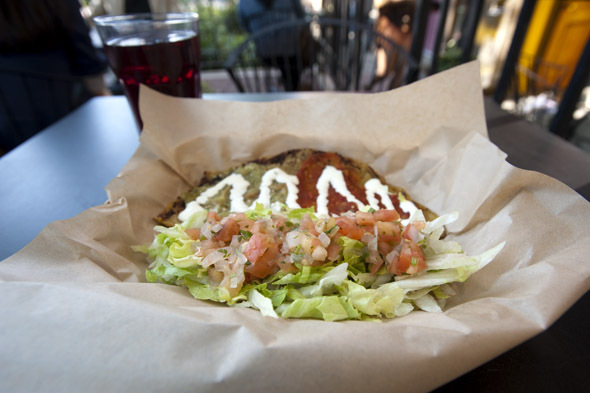 The Tlacoyo ($7), a bean-filled tortilla, is topped with salsa verde and salsa picante. 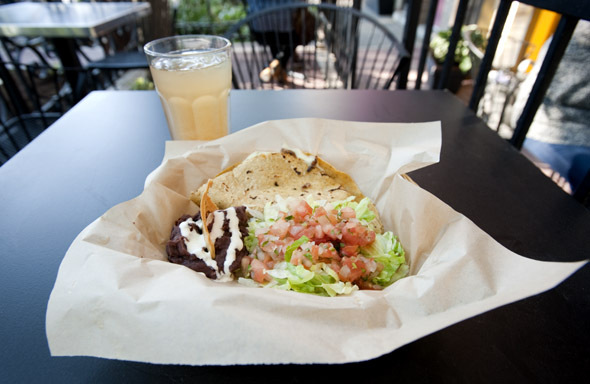 Like everything on the menu, it comes with a pico de gallo salad and velvety purple, whipped beans. 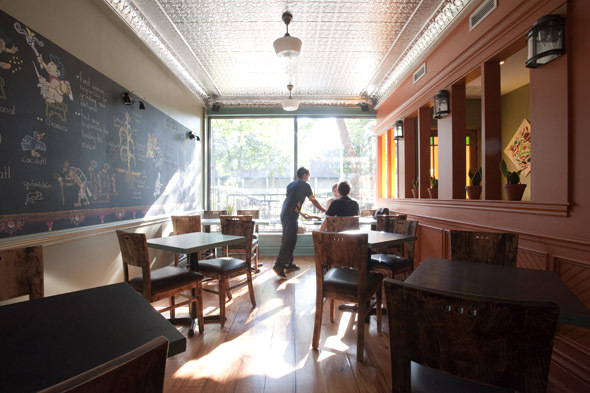 The cafÃ© is awaiting its liquor license before launching into full hours, but for now, you can pop in for a bite between 11 am and 7 pm on weekdays and from 10am to 2pm on weekends. Once the permit arrives, we can all look forward to tequila, sangria or Micheladas – a Mexican Caesar made with beer, salsa, lime and salt. This is the food that I want to eat all summer long. With inexpensive price points and a casual atmosphere, I'm already looking forward to no-fuss afternoons on the patio with good friends and a cold Cerveza.